Strap yourself in, this is going to be a super-two-fer book review! How many times have you been stopped cold because you just didn’t have the right words to close the sale or to make an announcement of some sort. These are two times in the live of a small business that can really make a difference. This week, I received two review copies of books that are in a series called Perfect Phrases. 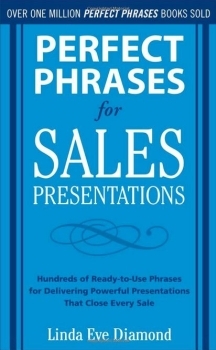 The one that caught my attention first was Perfect Phrases for Sales Presentations: Hundreds of Ready to Use Phrases for Delivering Powerful Presentations That Close Every Sale and it’s companion Perfect Phrases for Writing Company Announcements: Hundreds of Ready-to-Use Phrases for Powerful Internal and External Communications. Both books are written by Linda Eve Diamond and both have been a Godsend to me. You see, even though I’m a big time talker, when it comes to making announcements or starting a sales conversation – or even responding inside of a sales conversation – I’m often speechless. It’s like I can’t think fast enough on my feet. I can’t tell you how thrilled I was to receive these books as review copies. Because more often than not, what stops me is simply not knowing what to say. Both of these books solve that problem by giving you more than enough phrases that you can choose from and practice with to get you over that insecure hump and get you into the conversation that matters. I’m going to start with Perfect Phrases for Sales Presentations because I suspect that this is the one you are really interested in. First, let me tell you that this is a book you can carry in your briefcase, purse or computer case. It’s just under 180 pages and it’s going to be your go-to cheat sheet for the next time you do a sales presentation – no matter what your level of expertise. The book is divided into three sections. The first section is a foundation builder; mindset, attitude and who you need to be to become successful. Part two contains the meat of the book – it’s the one that’s going to have all the dog-ears. Part three is designed to get you into the habit of practicing, strengthening and implementing what you’ve learned here. Ideally, the intention is to wean yourself off the book. But if you’re like me, you’ll skip sections one and three and firmly use section two. This book is killer useful. But one thing that was missing for me was the social media aspect of prospecting. These days so many people make first connections online, it would have been nice to have these phrases customized for LinkedIn or Twitter. That’s not to say that you can’t do this with the phrases that are offered – it’s just that it would have made the book more current for today’s selling environment. Let’s jump into the next book about phrases for company announcements. I say that this is an ignored area of company communication and one where people tend to get – how shall I say – LAZY. This is why it’s often the brunt of radio shows and jokes where people read silly emails and corporate announcements and focus on the poor phrases and flat out miscommunication. I also call this a communications opportunity because internal announcements speak very loudly about the unstated culture of a company. For example, it’s not unusual for organizations to say that “people are their most important asset” and then to put out announcements that give the opposite impression. Internal announcements are a critical component to maintaining and building corporate culture and morale – and deserve more attention than they get. Like Perfect Phrases for Sales, Perfect Phrases for Writing Company Announcements is divided into three parts and follows the same structure; introduction, phrases and an implementation section. Below are just a few phrases that I found really useful. Linda Eve Diamond is the author of several books in the areas of education, self-help, motivation, teambuilding, business writing, and poetry. Listening is a critical skill is a central theme throughout her diverse work. After writing and teaching indication skills in a corporate training setting for nearly 15 years, she decided to find to her focus on communication by exploring the importance of listening from the inner to the interpersonal. She’s written more than seven books on these topics and has co-written Perfect Phrases for Writing Company Announcements with her mother, Harriet Diamond, who is also an accomplished author of several training books. If you’ve been looking for some handbooks with ready-to-use phrases to get your conversations started and move them forward, these two are a great addition to your library. The post Two Books with Perfect Phrases to Help You Get the Job Done appeared first on Small Business Trends.